On October 8, 2011, Kathryn V. celebrated her 75th birthday in a house filled with laughter and love, courtesy of her husband, Gerry, 80, the couple’s four children, and 10 grandchildren. Diagnosed with amyotrophic lateral sclerosis (ALS) in 1998, Kathryn defied the odds, as her disease progressed much slower than anticipated. 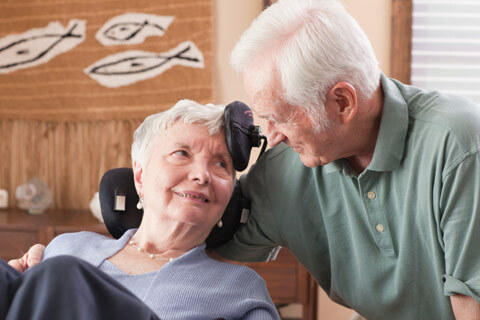 ALS causes nerve cells to waste away or die, preventing them from sending messages to the muscles. This eventually leads to muscle weakening, twitching, and an inability to move the arms, legs, and body. When the muscles in the chest area stop working, it becomes difficult or impossible to breathe on one’s own. Kathryn, who worked for years as a math professor at numerous colleges and universities, did not let her diagnosis stop her from teaching. At first she used a cane, then, a wheelchair. But after three or four years it got to be too much, and she had to stop working. The disease had progressed to the point where Gerry knew he couldn’t handle her care on his own. 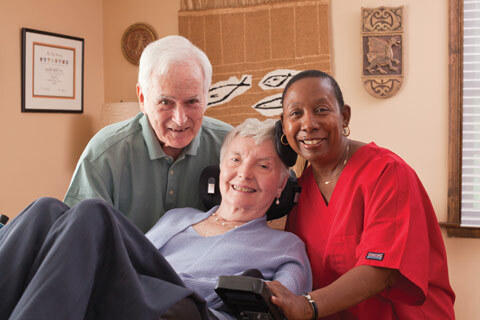 Gerry contacted BAYADA Home Health Care and found out that a home health aide (HHA) would be able to meet Kathryn’s needs and improve her quality of life. “Connie and Kathryn were like peas in a pod,” Gerry shared, describing the friendship that developed in the eight years Connie cared for his wife until her passing on March 8, 2012. Connie adapted to the differences in the level of care she provided to Kathryn with compassion, patience, and skill. During a typical day, Connie bathed and dressed Kathryn, washed and styled her hair, fed her, and helped with toileting. Connie also took her clothes shopping or to ceramics class. And thanks to a special stand used to prop up books, Kathryn was able to continue her love of reading, while Connie helped by turning the pages. Modern technology also helped Kathryn. At first, voice activated software helped Kathryn stay connected. Then, when her voice became unrecognizable because of the disease, Gerry connected their computer to the flat screen TV. A reflective dot was placed on Kathryn’s nose to interact with a sensor, which, in turn, interacted with the computer. Connie learned how to set up the equipment for Kathryn, who then controlled the mouse with the movement of her head. “We always adapted to each new challenge as her disease progressed,” says Gerry. Married 51 years, Gerry described his wife as a gutsy, determined lady who insisted on living life as fully as possible. Fortunately, Connie was there by her side, helping her have the best quality of life, despite her diagnosis. In 2008, Connie’s exceptional care and compassion for Kathryn earned her the distinction of being named BAYADA Home Health Aide Hero of the Year in front of thousands of employees at the company’s annual Awards Weekend in Philadelphia. Connie’s husband, sister, father, mother, and of course, Gerry and Kathryn, were there to support her as she accepted the prestigious award. For additional resources on ALS, click here.